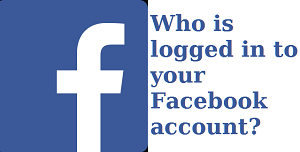 If you are worried that your Facebook account may have been compromised you can check to see if anybody else is logged in – and log them out – and then you should change your password, just in case. Most of the time rogue log in details are actually your own logins that have for some reason persisted, i.e. there is nothing to worry about. 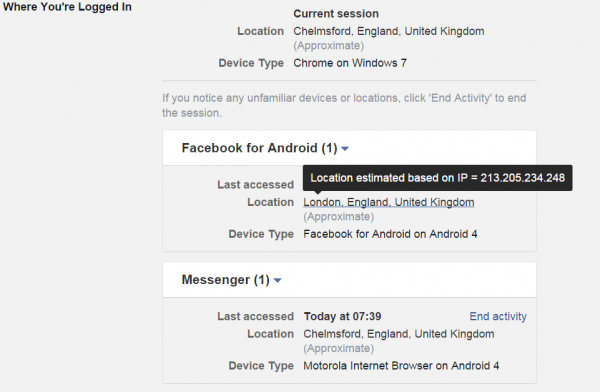 To find out where you are logged in to Facebook go to Settings and then Security, then select Where You’re Logged In. This is my Facebook page. All those Android 1 logins are from my old phone G1 (switched off / abandoned). I shall delete those now. Nothing to worry about, it is just that the Facebook app for my phone did not end the login properly and it looks like I am still logged in. If you hover your mouse over the Location it will show the IP address used. You can find out if it is you by typing “what is my IP” into Google. The first result is my desktop session and the second (IP not shown) is my mobile phone session. This is my BT Infinity ISP. It is a good idea to prune any redundant logins. In the unlikely event that your account has been compromised but you still have access, end all sessions but your current desktop one (ideally, assuming you have desktop) and change your password. Check nothing else has been altered on your account, e.g. your email address. The chances are all is well, sometimes things just look suspicious.